We love the idea of hosting a soccer party. It can range from a birthday to an end of season party. Soccer theme parties will impress all your fans! 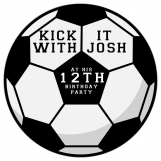 If you have a huge soccer fan in your life, then planning this event will be an easy "goal". Start with a fun invitation will all the party details. The great thing about the game of soccer is that you can have it outdoors. Find a local park that has fields set up already or bring your own set of pop-up goals. It doesn't take much to entertain a group of soccer fans. Set up some cones and bring a couple of soccer balls. Set up a friendly soccer game. Adults versus kids is always a hit. If you don't have even amounts, count off then have each team pick their captain. Once the game is over, have a soccer pinata filled all kinds of toys and treats. If you have grown-ups, have two pinatas. The grown-up one can have tiny plastic liquor bottles, suckers, and funny novelty toys. You can never go wrong with a pinata. Once everybody eats. Set up a game of Soccer Bowling. Set up bottles full of water in a triangle. Imagine how pins are set up in real bowling. Instead of rolling the balls with your hands, you kick the balls from a few feet away. Keep score exactly like you do a bowling game. Balloon Soccer is another option if you have little kiddos. This is a great game for just acting silly. First, set up two goals that are pretty close to each other. Separate your group into two teams. Then have them play a game of soccer with a balloon. It's as simple as that. You can also set this up as a relay. Just have the teams compete against each other as each person "dribbles" a balloon to a designated point and returns. it The first team to finish the relay wins. Here's a fun pro-tip: Make sure to pass out loud soccer horns to get the kids excited and cheering their teammates on. Inexpensive inflatable soccer balls can also be helpful for those that prefer to stay on the sideline. If your party is at your house, set up some fun decor. Get glass canisters and fill them with black and white candy. Set up trays with mini powdered donuts and mint oreos for a play on black, white and green. Adding cups of green jelly beans with cool soccer picks is an easy trick. Pick up some plastic champagne glasses and fill them with green jelly beans to look like the grass and then add the soccer ball pics for an adorable party favor. Then, make a goal in your backyard by placing a set of cones or portable goals. Line the crew up in front of the goals and have each person practice kicking or headbutting the ball into the goal. It's always fun to let them show off their fanciest or silliest trick. Make a contest out of it and have a prize. Then, have another contest to see who can keep the ball up bouncing the longest using their head, knees, or feet. This party is guaranteed to be a KICKIN' good time!